There were two interesting polls this week that present together a humorous, if chilling, picture of the state of the American democratic process. According to the New York Times, only nine percent chose Clinton and Trump as nominees. That is unfortunately no surprise. Donald Trump and Hillary Clinton are the least popular candidates ever to secure nominations of the two parties. 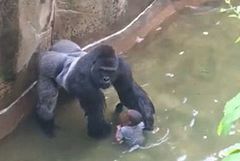 Then the Public Policy Polling found that in a general election matchup, five percent of Americans would vote for Harambe, the endangered gorilla that was shot and killed in May after carrying a 4-year-old around inside his habitat at the Cincinnati Zoo. Indeed, not only did five percent prefer Harambe (which seems quite sensible given the choices) but another four percent was undecided. So, those who want Trump and Clinton represent the same percentage as those who either prefer or might consider voting for a gorilla. In fairness to Trump and Clinton, the Public Policy poll shows Harambe at third place with Clinton receiving 48 percent and Donald Trump at 43 percent. Thus, they are both beating out the primate vote. However, given the New York Times calculation, only nine percent of voters actually supported the two candidates so Clinton and Trump appear within the range of statistical error in trying to pass a dead gorilla in popularity. One could ask, as we have previously discussed, how any country that prides itself on being one of the longest standing democracies could reach this point. The vast majority of voters dislike, if not despise, both Trump and Clinton but it does not seem to matter in the American duopoly of power. Moreover, Harambe has a number of things that neither of the mainstream candidates have been able to establish with voters. First and foremost he is self-sacrificing and authentic. Second, he is empathic and strong. Finally, he is absolutely honest. Clinton recently gave an interview that addressed her problems with truthfulness. That interview was given “four Pinochios” by the Washington Post. Trump for his part seems to think that business deals is the equivalent to giving your life in combat. In that company, Harambe is a stand out. I do like touring the resorts – the design and art is amazing. Steve Wynn really turned that town around although it seems like Cirque is on every block now. Autumn, When I’m in Vegas I bounce around to gamble. Caesars never has $5 tables so I don’t gamble there much. I’m fine w/ $10 tables but Caesars usually only has $25 and up tables. I like Bellagio, MGM, Mirage, Bally’s, but I hit many places. Downtown I like Binions. We stayed @ The Delano in April, which is attached to Mandalay Bay. When my bride is w/ me we stay @ nice places. When I go alone or w/ dudes I go cheap. But The Delano[used to be The Hotel] had great rates in April. It would be nice to have family in Vegas to visit. But, like you, I would never want to live there. Too crazy. Hell, I hardly ever gamble past 10-11p. After that time, all the drunks start being a-holes and ruining the crap and blackjack games. The worst are the 20 somethings acting like big shots. I don’t know how employees put up w/ them. you are cracking me up today with your simian analogies. The “Howler Monkey” is married to the “Bonobo”. Where did you go in Vegas? I lived there for a year and a half – worked at Caesars Palace for a bit. Vegas is not my kinda town though I like to visit as my bro and sis still live there. Wow! Either somebody didn’t read the NYT article or they didn’t understand it. First, it wasn’t a poll. It was an analysis of voting from the primaries (actual votes, not voting sentiment). Second, the click-bait title was extremely misleading as it included children and others ineligible to vote. Based on the data presented, the actual proportion of eligible voters who voted for Trump or Clinton in the primaries was 15%, not 9%. Still not good, but more accurate than the click-bait title would suggest. Then there’s the Public Policy Polling poll. It never identified Harambe as a gorilla. It simply identified him as an “independent”. (http://www.publicpolicypolling.com/pdf/2015/PPP_Release_National_7302016.pdf) Since many people have no idea who Harambe is, the true comparison in that poll is among Clinton, Trump, and an independent (human) candidate. This blog post gets 3 Pinocchios. Nick, it’s no surprise the GOP’s orangutan and the Dems’ howler monkey are in a dead heat with a silverback gorilla, who showed more humanity toward that little boy in a three-minute video clip than the other two tree apes have ever shown toward anyone else. I see that Prof. Turley has changed a guerrilla to a gorilla. Quite a feat. Che would be proud. Vote for Mickey Mousse, famous desert chef. I was going to vote for Mickey Mouse until the alligator incident. So I have changed to Bugs Bunny or the Road Runner. Haven’t decided yet. There’s an orangutan @ the San Diego Zoo I would vote for. She is smart, inquisitive, empathetic and not bad looking. For an orangutan. I think a primate could be taught to deal blackjack. They couldn’t work a craps table. When Atlantic City got gambling back in the 70’s they recruited math teachers to work craps tables. A college buddy of mine was teaching algebra @ the very tough AC High School. He went to work @ Resorts Casino and tripled his salary. I spoke w/ a pit boss recently in Vegas. They have a hard time finding young people to train on craps. They can’t do math well and can’t do it at all in their heads. This is an interesting “poll”. Why does someone not go to the statistic on the election polls and see who voted for whom in the primaries. I recall that Trump won the Republican Primary elections and Hillary won th Democratic primaries. Do not let the Donald……( DUCK) see this article…or you will be on his ” hate ” list. Your life, will never be the same.!!! He could even set up a Super Pac, to destroy you.!!! The post above discusses both a guerrilla (end of the first paragraph) and a gorilla (everywhere else). Looks like Trump is dragging down the level of everything in this country. I’m pretty sure the gorilla would not vote for anyone whose head of hair hair resembles an orangutan’s. We had a person in senior management who I was able to prove, as I confided in several co-workers, that a monkey could do a better job than he could. This person was the highest paid manager in the organization but he made foolish, and detrimental decisions more than seventy percent of the time. On the other hand, a monkey when presented two possible random choices statistically will be wrong only fifty percent of the time. Or, the monkey would simply refuse to answer and walk away or could not conceive what was being asked and stare blankly into his handler’s eyes, saving the organization from the duress of a poorly crafted decision. The real question is who this gorilla would have choosen for president.